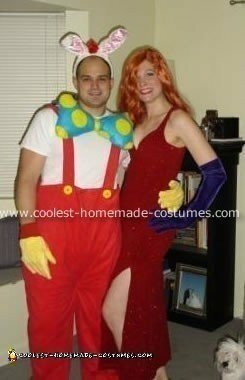 After a couple of years of begging my husband to dress up as Roger Rabbit to my Jessica Rabbit, he finally caved! It all started when one of my friends was getting rid of this awful sparkly red dress she had worn to a high school dance sometime in the mid-90s. I saw it and immediately thought that I could whip that baby into an awesome Jessica Rabbit dress. For the dress, I sewed up the sides to make it super tight, and cut a slit in the side. I have to admit, it could have been higher if I had really wanted to be accurate, but I’m a little on the modest side! I am not “well-endowed” per say and could have never pulled off a strapless version, but I hacked out a huge chunk of fabric to make it super low cut and used a mess of safety pins to pin it to the inside of the best pushup bra I could find. The biggest investment was the wig; I think I spent about $15.00 on it and about $8.00 on the gloves. I got both at our local fly-by-night Halloween shop. For the Roger costume, I bought 3 yards of red corduroy from Wall-Mart and made a pair of pants. I am not a seamstress; all I did was take two giant rectangles with the slits in them for legs and sewed them together. It made it a little uncomfortable for my husband to sit down, though!! I made the bow tie out of felt with chopsticks inside to make it stick up. We bought the ears and the gloves from Wal-Mart – the gloves are just yellow felt work-gloves. Even though our Roger Rabbit costume was home-made, we were a huge hit at the party! I will say that I was a bit bummed that some of the younger kids at the party had NO idea who we were. I guess we are just getting old!! where did your husband find the items for this costume? i really need to find red overalls and the bowtie. red overalls are extremely difficult to find, it is easier to find white ones (like painters use) and dye them red. Hey, me and my boyfriend are interested in buying your costumes if you are selling! We live in Spokane Washington!